The sort of accessory that I didn't know I needed until I started using one. I have already got some different stylus pens for use on touch screens and when this product was offered to me to test and review, I really thought there were too many in the package, eight long and eight short. However, with so many devices now being in the form of tactile tablets, one cannot overstate the convenience of having a stylus wherever you may need one. The sixteen styluses are sold inside a resealable plastic bag, each stylus individually protected by a plastic sleeve. So they have thought of everything, even including a lovely, soft cleaning cloth. 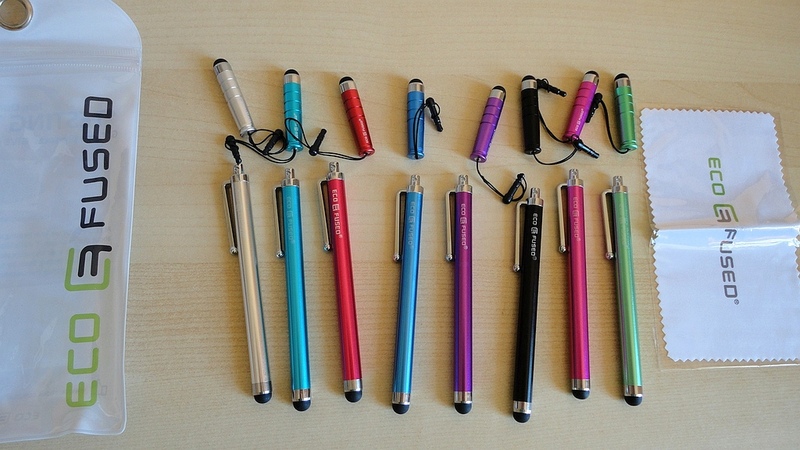 With this charming selection, you have a wide choice of highly-visible colours but also the option to have a long or a short stylus and different attachment options. 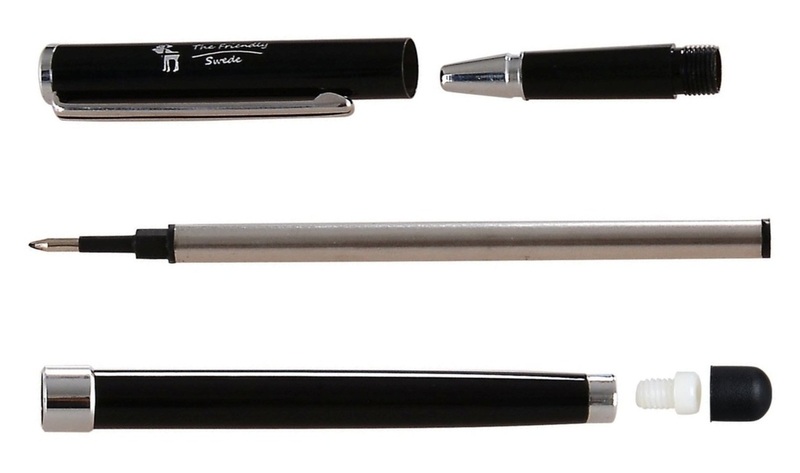 The longer pen-like stylus has a clip, rather like a pen, for securing to a dress pocket or the interior compartment of a handbag; there is also a hole at the very top where a piece of string or lanyard could be threaded through. The short stylus features a built-in cord tied to a plastic tip which fits securely in the audio/earbuds socket of most phones or tablets. It could even be argued that having the short stylus in place will keep dust out of the socket. Using the short stylus requires a different sort of grip, but they are so handy to have as spares. The main reasons to use a stylus in preference to a fingertip are fairly obvious. It facilitates tapping, flipping pages, accessing menus and commands with much greater ease, and allows greater accuracy when searching, typing and navigating the web. It also keeps the glass or plastic surface of the device free of fingerprints, oily smears and contact marks, greatly reducing the need to wipe them clean and the likelihood of scratching the surface. The rubber tip is soft and squishy but very responsive on screens both protected and not, and now doing without makes me feel like I am “all thumbs”. I can't assess durability as I haven't used any one of them long enough to test its lifespan, but with the whole purchase coming to less than £10 ($10), they are clearly intended to be expendable. So, my final verdict: cute and useful, and a steal at the price. This is the sort of thing that I didn't know I needed until I got one. When I was offered this small device to review, I was more curious than expectant. I use my Kindle Fire HD every night and any time I have to wait (doctor's office, long car ride as a passenger) and noticed that, however clean my fingers appear to be, they always leave a set of smears on the Kindle's face. So wiping the glass clean was irritating but imperative before any reading session. Not any more, because the fibrous tip of this stylus leaves no discernible traces. Apart from flipping pages, and accessing menus and commands with much greater ease, the stylus gives me amazing accuracy when I am searching, typing and navigating the web. Time-saving, satisfying and really quite indispensable when I use my tablet to make purchases. Now doing without makes me feel like I am “all thumbs”. The other half of the 2-in-1 is a pretty nifty ball-point pen. As a life-long pen freak, I still collect and use a variety of fountain pens, and have my firm favourites when it comes to felt-tip, ball-point and rollerball types, so please forgive my accolade. The pen included in this stylus really delighted me. It has the fluid, smooth, effortless action that encourages hand-writing and brings out my most individualistic calligraphy. I love my fountain pens because they produce results I find pleasing, whereas with some cheap ballpoints, my handwriting is horrible. This pen is as good as some of my favourites. 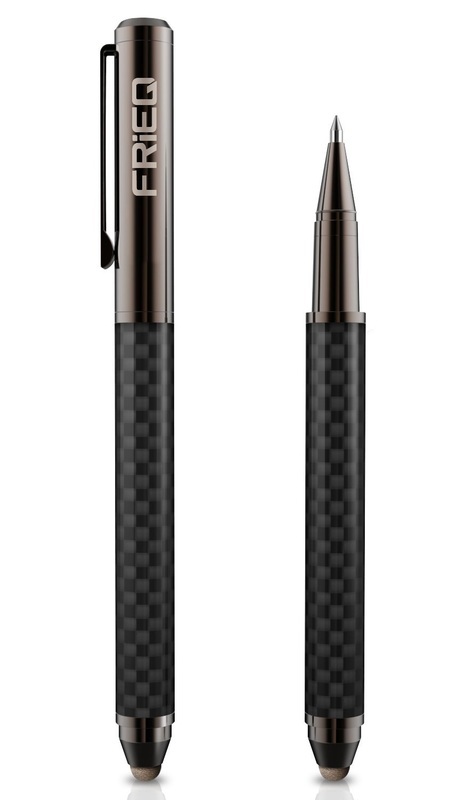 It is beautiful to look at (it reminds me of a Caran d'Ache), with the cap over the fibre tip the balance is just right, and it lends itself to different grips when used with a tablet. My only regret is that it lacks a protective cap for the fibre tip. I was already familiar with the solid quality of other FRiEQ products, but this stylus takes it to a new level. 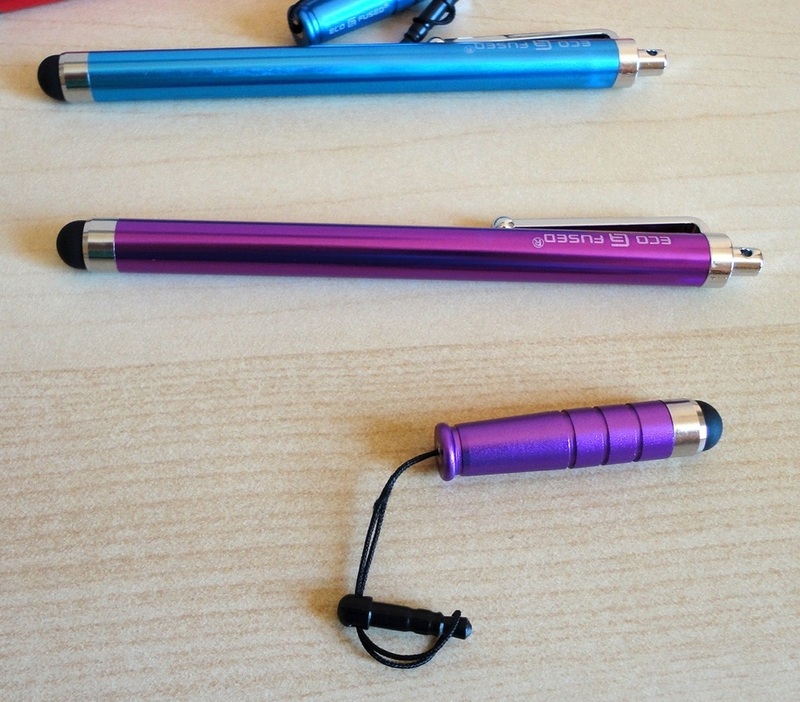 I have another stylus/pen combination which I love, and this new product from The Friendly Swede is every bit as good. Using it with my Kindle Fire HD, I find it very accurate, responsive and a joy to use. The main advantage of a stylus is that, however clean my fingers appear to be, they always leave smears on the Kindle's face. So wiping the glass clean was an annoying but essential step before any reading session. The tip on this stylus is rubbery and very springy. It glides easily, taps reliably and leaves no discernible traces. Apart from flipping pages, and accessing menus and commands with much greater ease, when I am searching, typing and navigating the web, this stylus gives me the kind of accuracy that I could never achieve with my fingertips. Time-saving, satisfying and really quite indispensable when I use my tablet to make purchases. Now I have got used to a stylus, it feels odd to use a tablet without it. Under the pull-off cap is a very nice ball-point pen. I enjoy hand-writing and value good pens, in fact, I am a bit of a pen freak. This pen pleases me, and it brings out my best penmanship. It has become one of my favourites. The body is a bit narrow but does not feel slippery and allows me to adapt my grip. This particular set includes two identical pens, one white, one black. Replacing the cartridge is a simple matter of unscrewing the bottom half. These pens take standard Cross ballpoint refills (which is great as they are easy to find and inexpensive). The nice little extra with this set is that it comes with four replacement rubber tips and a beautiful little microfiber cleaning cloth, embellished with the rather cute moose of The Friendly Swede logo. I was sent this lovely set for evaluation and review purposes, and am delighted with its quality. I am not a gamer, so this review will not be terribly useful to those who want in-depth specs and gaming performance reports, BUT I wanted to make the point that there is absolutely no reason why a mouse this good should be restricted to that specific top-end use. Yes, you can take the time to experiment and play with the complex programming options for the three basic buttons and the extra three side ones, but this little beauty can be just as useful as a standard computer mouse. At this price level, it makes sense to choose a precision instrument that lights up in four glorious colours! I have made a very short video just to show this feature because the photos don't do it justice. In the package you will find the SK-T2 mouse, a small CD with the driver that allows customization and a book of instructions. I chose the SK-T2 model over the closely-related SK-T1 because I understood it to be more suitable for smaller hands. It certainly is, and I find my medium-sized female hand drapes comfortably over the contours, however, the SK-T2 is an equally great fit for my husband's larger hand. We both find this mouse incredibly comfortable to use for extended periods of time. The action is ultra-smooth, precise and reliable. The clicking mechanism takes very little effort but is not overly-touchy either, so you can stay in close contact with all the buttons without accidentally triggering anything random. My nephew informs me that he loves this mouse so much he's going to buy his own for his favourite games that require a fast response and high accuracy. 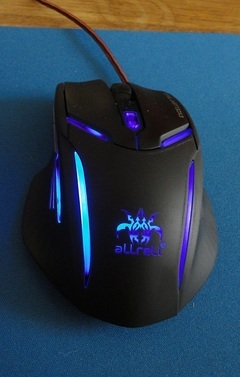 As for me, I just love using this mouse, and much prefer it to the basic one I bought for about the same money. I was given this model for testing purposes and for my honest and unbiased review, but I would have been happy if I had paid the very reasonable price. Black, bold and muscular with a sculpted design that supports all your fingers. This is quite a large mouse with a relatively high-domed profile, which at first sight looked a bit too big but, despite appearances, I found that my medium-sized hand drapes easily over it. My husband also finds it very comfortable. Even after several hours of continuous use, it remains ergonomically friendly and has not caused me any strain. One potential drawback: as it is designed for right-handed operation, it will not suit a left-handed person. 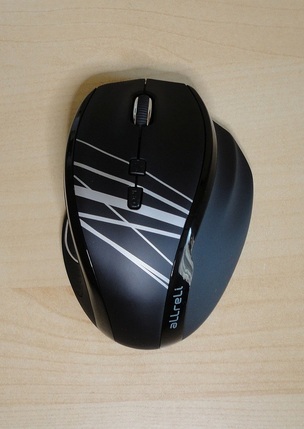 In the box you will find the M535 wireless mouse, a mini-CD with the driver that allows customization and an instruction manual in English. Batteries are included (two AAA alkaline ones) but, strangely missing from the manual is any mention of the dongle (nano USB wireless receiver), which is tucked into a small receptacle next to the battery housing. With the dongle inserted into a USB port on your laptop, your computer is ready to recognize the mouse and make the wireless connection. Since the receiver is so tiny, I just leave it plugged into the laptop's USB port, and the mouse connects immediately. One smart feature is that pressing the topmost button will return the pointer to the middle of the screen, for those times when it becomes “lost” in an invisible border or such. Although the mouse glides easily over my pad, it has a slightly “heavy” feel but I'm getting used to it. The action is smooth, precise and reliable and can be fine-tuned to your liking. Left and right clicking takes very little effort but is not so sensitive that it triggers anything random. Scrolling is smooth and convenient. 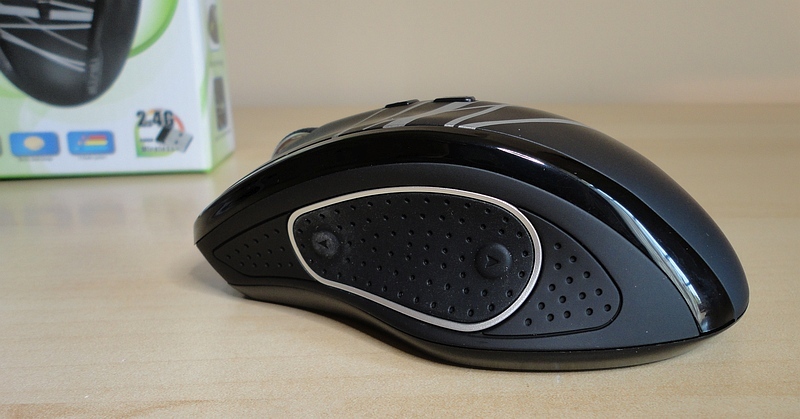 The other buttons can come in handy, and there is a left section that pops out of the body of the mouse. So far, I have stuck to the basic operation but it is great to be given so many options. I was given this model for testing purposes and for my honest and unbiased review, and I am happy to have this fine mouse especially useful to minimize clutter around my laptop.